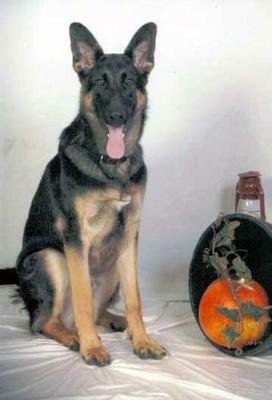 I would like to enter Jacob in your German Shepherd contest. He is now 8 months old. He was seven months at the time of the picture. Jacob is a joy to everyone around him. He is nothing but a sweet loving guy. He enjoys making children smile and coming over for them to pet him. He may look intimidating but he is a gentle guy. I figure he will probably get a bit bigger and he will be perfect for being a therapy dog. He has gone through puppy through advanced classes and well shall we say, he has been the charismatic one of the group. He tends to be the guy they sit next to a timid or aggressive dog because he brings them right around to enjoying the class. Jacob was Batman for Halloween and was in a parade. He started out in the front of the parade and as we went along the kids would yell for Batman, he had to show his appreciation for the attention by going over and having each one pet him. He had one young boy whisper to him that he was going to be Batman too. You couldn't resist the cute smile on the little boy's face and I asked him if he would like to give Jacob any special tips so whatever he whispered to him next I didn't quite make out but he was beaming and his Dad thanked me for letting Jacob come over and see him. ended the parade somewhere between the middle and near the end. Jacob was a hit! when he proves to us but again he is a puppy with all his puppy ways.